There are few men in London better calculated to delight and interest the in­telligent American traveler than this young artist of Punch, who is more American in thought and habit than are three quarters of the people in New York. In person Mr. May is of medium height and slender build. His face is a peculiar one, because of the heavy shock of brown hair that comes well down over his forehead, the long nose, the very light eyebrows, and the amused smile that hovers perpetually about his lips. He is extremely quiet and modest, talking very little, and then in a low voice, but listening always, and appar­ently profiting by what he hears and sees. He is a notable figure in London life, and there are very few circles of society in the English capital in which he has not some acquaintance. 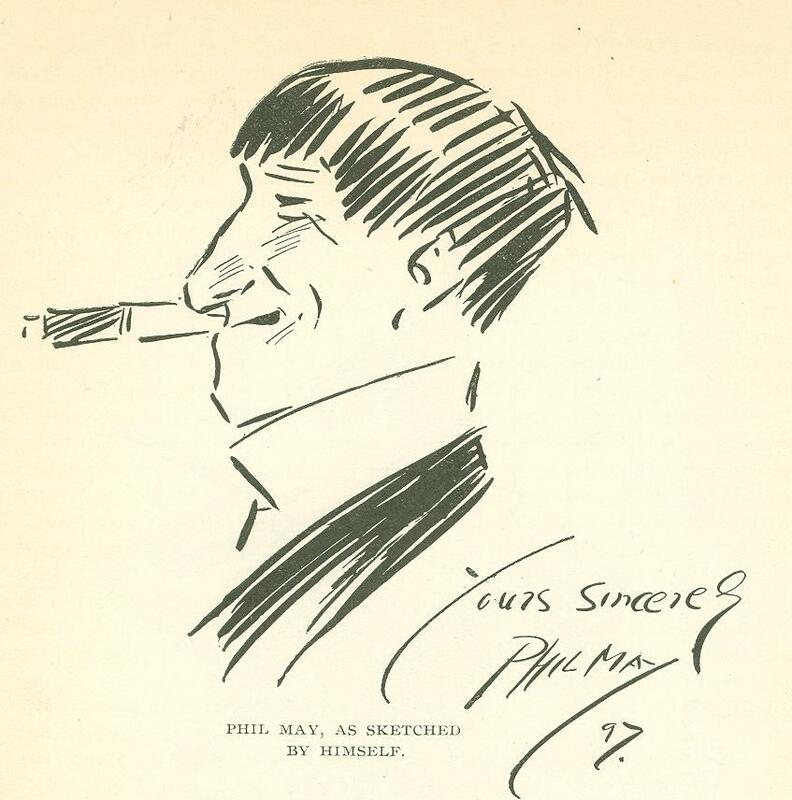 But whether chatting with a swell in a club window, or hovering about the avant scene of a music hall, or watching a dozen children dancing to the music of a hand organ, he is always the same observant, keenly humorous, appreciative, and quiet Phil May, known in every part of London, and popular wherever known. His work is generally done in the big studio that occupies the greater part of the second floor of his house. He lives in Lon­don most of the year, in one of those de­lightfully quiet little byways that are to be found everywhere throughout Kensing­ton, Chelsea, and, in fact, in almost every quarter of the town. The late Lord Leigh­ton lived in the same street about three doors away from him, and two or three other artists of note have been his neigh­bors. He is, of course, a regular attendant at the weekly Punch dinner, but disclaims any intention of posing as the "succes­sor" to the late George Du Maurier. He was a member of the staff for some time previous to the elder artist's death, and the styles of the two men are so totally different that it is absurd to speak of the one as filling the place of the other. It is always a dangerous thing to at­tempt to show that a man is a humorist by repeating his witticisms, because, after all, there is no recognized standard of value in wit or humor. I may say, however, that to those who have known Mr. May, or seen photographs of him, the sketch by himself which accompanies this article is sure proof of his qualifi­cations as a true humorist. No one else could have made fun of his own features as cleverly and truthfully as he has. But the strongest proof of his humor­ous quality is to be found in his pictures of London street life, now widely known through the medium of his book, "Gut­ter Snipes." The sadness and pathos of some of these faces could only have been drawn by a humorist, for no one else could possess a fitting appreciation of the sorrows of such lives. In a word, Phil May's reputation has been made not by his broadly humorous work, in which he also excels, not by his exquisite skill as a draftsman, but by his humanity, by the tender sympathy with which he approaches even the roughest, the raggedest, and the most besotted of the unfortunates that his genius depicts. With a few strokes of his pencil he writes the whole sad history of a human life. He does this not by a mere slavish study of externals, but from his own inner perception of what suffering and endurance really mean. In this peculiar line of work I know of no one, either in this country or in England, worthy to be compared with him. "If a man's bad I can tell you why he's bad, but when he's as good as Phil I can't tell you why he's good, because if I could I could do just what he's doing, and I can't. All I can say is that his work is just sticky with human interest, and that's all there is about it! " Originally published in Munsey's Magazine. June 1897.